Growing your following on social media is, or at least should be, important to nearly all businesses – and there are many social media strategies that you can use in order to do this. Examples include; using interesting and well targeted content to slowly build a community, creating digital marketing campaigns with the hopes of going viral, mass following and unfollowing accounts, or simply buying followers. But is there a right or a wrong way to do it? There are many companies and apps that allow you to spend small amounts of money on buying followers for your social media accounts – or let you gain followers in a “like for like” manner. This involves the app giving you a selection of photos to like or accounts to follow and in return the app sends your images or account to other users for them to like or follow you. But is buying followers ever a good idea? I would say no. Even if from a moral perspective you can handle the fact that you’re trying to deceive people, ‘Automated pro-active following and automated un-following’ are not allowed on twitter and could result in your account being closed, and I’m pretty sure other social media channels have similar rules. Some small businesses use these methods to make the account appear more popular to try to encourage real followers and engagement – because, as a rule, people don’t like to be the first to act, and so on Instagram for example, having some activity in the form of likes or followers, could encourage others to take the leap of interacting. This is risky strategy though. You run the risk of having your account closed or suspended, or gaining a bad reputation if people catch on to what you’re doing. Saying this, Forbes wrote an interesting article showing a list of celebrities and the percentage of their followers who are fake. But perhaps there’s not much worry of them being taking off Twitter for this. Another method which some businesses seem to have successfully used to grow their follower count is the tactic of following large numbers of accounts and then unfollowing users who don’t then follow them back. As Twitter, and other platforms, send users a message to say who has started following them, adding someone can be a way of making them notice you and prompt them to consider following you back. Positives about this would be that they are likely to be real accounts, as you can use twitter management tools to filter accounts to follow based on how active the user is. Also if the user then decides to follow you back, it is likely to be because they are actually interested in hearing more from you. Negatives are however that you’ll see that Twitter say in their Best Practices that they watch out for users who repeatedly follow and unfollow other accounts in large numbers, and again this may lead to account suspension. Twitter has shut down some account management tools such as TweetAdder because they help people to break these rules. It can also look bad for companies to be following very high numbers of accounts because it can be obvious to other users that they are using these methods to grow their following. Just like Google, social media platforms also use algorithms to decide which content is given a high ranking and is shown to more people using their platform. The different ways people interact with content are given different values. If something has lots of comments, this can be a more significant sign that this is good content than, for example, how many followers an account has. To write a comment takes a stronger level of engagement than to simply click a button. This is an argument for slowly growing your collection of followers who have a genuine interest in what you are offering, as these people are more likely to want to interact with your posts. It is also an argument for trying to create potentially viral content, as the idea of this is to encourage people to interact with the content by commenting, liking and sharing. Do your #research. For lots of businesses, hashtags are a great way of targeting content to users who are looking for products or services like yours on social media. Look at other companies who have a similar offering or who are in the same field as you and see what hashtags they are using, and which ones seem to work well for them. Picking up on trending hashtags, if they are genuinely relevant to your business can be useful. A quick Google search for popular hashtags will give you a list of websites where you can choose from lists of hashtags which are being searched in high volumes on Twitter. Only pick the ones which are relevant to your post so you don’t seem spammy. Just like with search engine optimisation (SEO) for Google where you use keywords, hashtags are phrases used to search – and so you want to use ones which people are actually searching for. Making up your own hashtags for areas of your business and encouraging others to use it could be useful. For instance, Urban Outfitters use the hashtag #UOONYOU where customers share their images of them wearing Urban Outfitters clothing. This can help get people to spread the word and create a bit of a community around your brand. Have a theme. 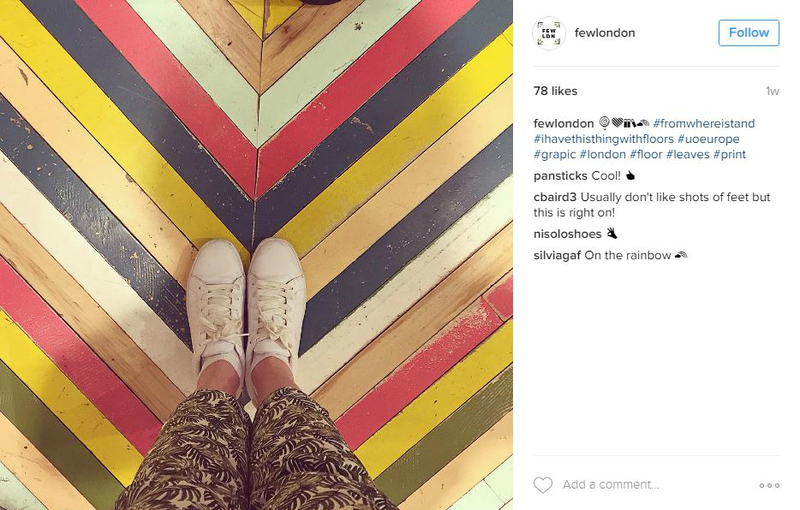 On Instagram particularly, you can post images which you know will be popular such as pictures of feet with fun flooring or #foodporn snaps – whilst we may enjoy them – they are really only good for ‘likes’. If you want followers, and for those followers to turn into customers, you need to attract people who are interested in what you are offering as a business. So, try to post content which gets people engaging with your brand because they like what you’re offering as a business. This is likely to require more effort but if done well, it will be a lot more worthwhile. Think about what your audience is getting from what you’re posting. Posting content which people find useful will help to build trust and help you to become a go-to source for people looking for information within your area of expertise. This can be ‘information’ in the form of inspiration or in a more obvious way in the form of top tips. If people find what you’re posting useful it should encourage them to want to hear more, and so make them want to follow you. Business is not a simple contest of ‘He/she who has the most followers wins’… it is about getting a good return on investment from your social media efforts – and you don’t get this from buying followers from fake profiles. It takes a lot of careful thought, planning and continued attention. If you’d rather have someone else take the wheel for you on your social media journey, or if you want to talk to our agency for advice then get in touch or comment below.